Three memorable experiences in Nan, things to do in Nan. 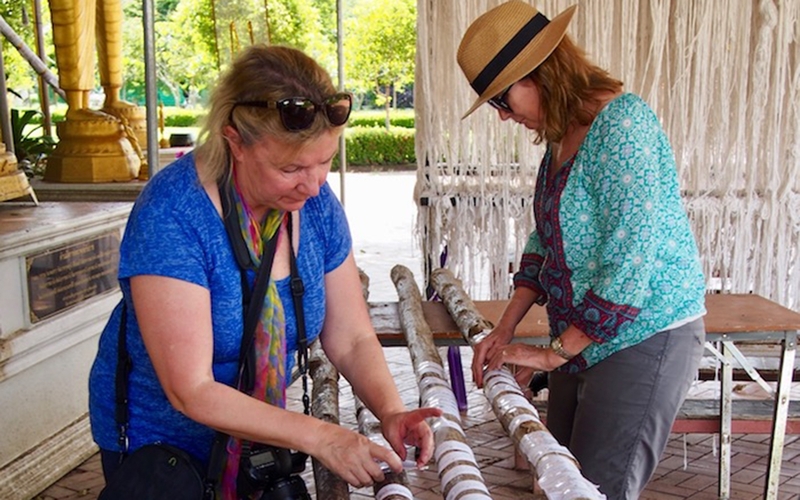 Travel blogger Amanda Kendle visited Nan following the Australian Society of Travel Writers convention recently, and discovered three memorable experiences in a place she knew little about previously. Amanda shares her discoveries on her blog, not a Ballerina. Here’s an extract of Amanda’s blog post, for an idea of things to do in Nan. For me, travel is often less about the destination itself and more about my experience of being somewhere different and new. Nan was a gorgeous place to visit, with very few western tourists, and it was made more special by the particular experiences I had there. In Nan, Thailand, there are a heap of temples and because we were there for a short time, some we only got to see from our tourist trolley-bus ride around town. But we did get to spend some extended time at a couple, and on the first day in Nan our special temple visit was to Wat Phra Tat Chat Haeng. where we were able to write good wishes to be stood in poles at the bodhi tree – I love this kind of ritual, like the ema wooden plaques you can write on at Shinto shrines in Japan. On our second day in Nan, we were taken to the Wat Phumin, Nan’s most famous temple. It’s a beautiful temple with amazing paintings and murals on all the inside walls – I was mesmerised by all the stories you could encounter in these paintings. It also has a really impressive four-sided Buddha statue at its centre, and in another building a little separate, a pretty gory depiction of hell. 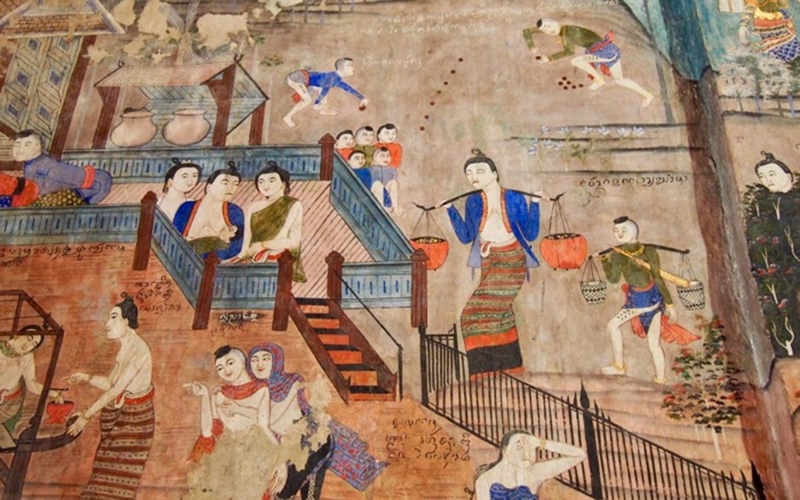 It was the murals depicting all kinds of everyday life and stories from the time it was built a few hundred years ago that impressed me most, though. Back in Bangkok a few days earlier, I’d started to hear rumours about Nan being flooded and it not being certain whether our trip would make it there or not. A couple of our plans were rearranged because some of the people involved were still very busy cleaning up their homes post-flooding. If I hadn’t tried to ask more, I think I would have been quite unaware, so I’m extra grateful for wonderful hosts who managed to make our trip memorable despite nature trying to intervene. We got up pretty early on our final morning in Nan to go into town and give alms to the monks at 6.00am. This is a special experience and one that I’ve heard has become overly touristy in some parts of south-east Asia, so I felt very grateful to be able to do this here in Nan, as one of very few tourists – in fact, we didn’t see any non-Thai tourists at all. By the time we came to our final dinner, I had got to know all of our group members well enough to decide that I would miss them horribly when our trip came to an end the next day! 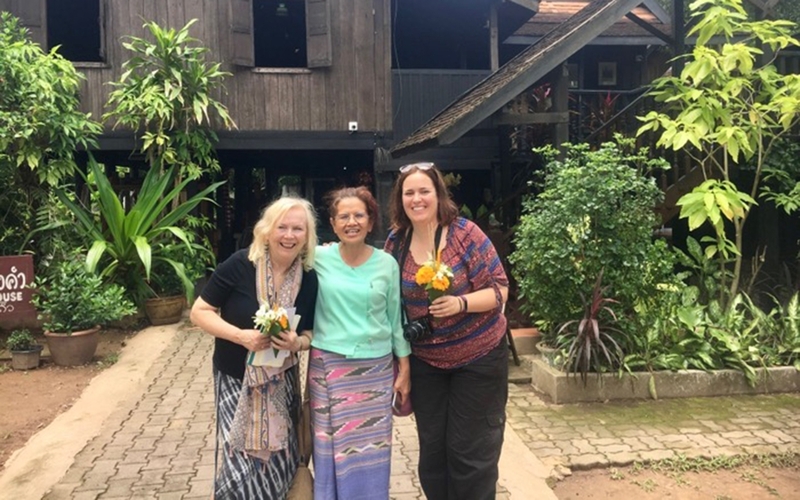 We also had some special moments getting to know the locals, and my favourite of these – in fact, one of my favourite moments of the whole trip – was at Hong Chao Fong Kham Folklore Museum. 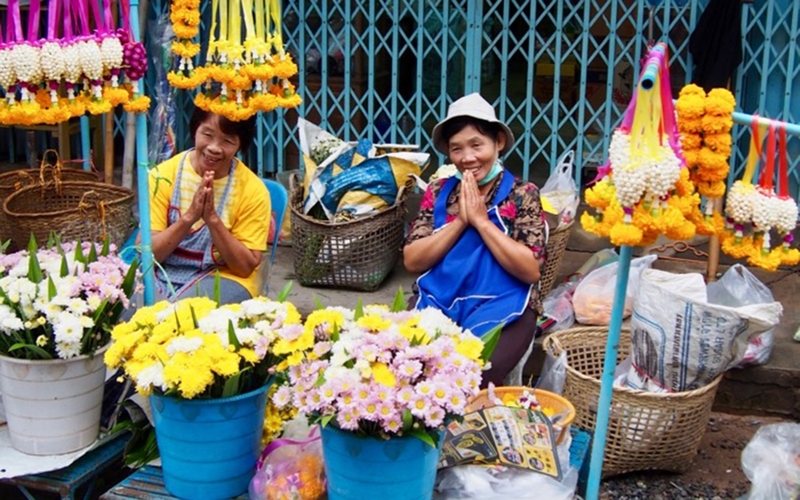 We were taught to make flower cone offerings to leave at the temple, by folding banana leaves and arranging flowers. The folding part was rather tricky – let’s call it Thai origami – but I was determined to master with it, and sat with Aunty Pat, the boss of this gorgeous Lanna-style house, for a long time, getting her to show me over and over. The stay has certainly lingered and along with Phrae, I’d highly recommend this part of Thailand to anyone who wants to escape the heavily touristed spots and experience some special Thai culture. Read the full article on Amanda’s blog: not a Ballerina.